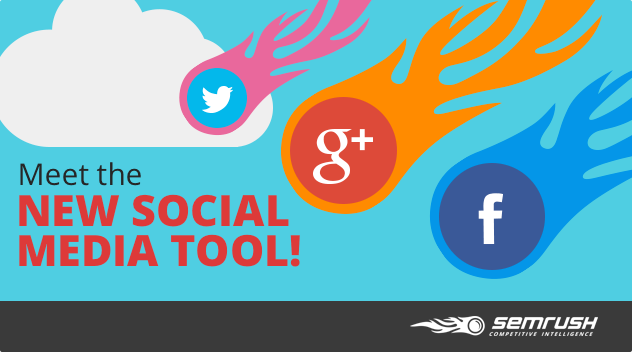 The SEMrush Team is proud to announce the release of our brand new Social Media tool. Designed for gathering competitive intelligence on both your and your competitors’ social media accounts, the new tool will help you track social audience, activity and user engagement on Facebook, Twitter and Google+. First, we collect and process data from your and your competitors’ social media accounts -- from Facebook, Twitter and Google+. Then we display it in a detailed and convenient report that is divided into two tabs. The engagement rate measures how well your audience interacted with your social media page for a selected period of time. Basically, it tracks user activity and compares it to the total audience number. 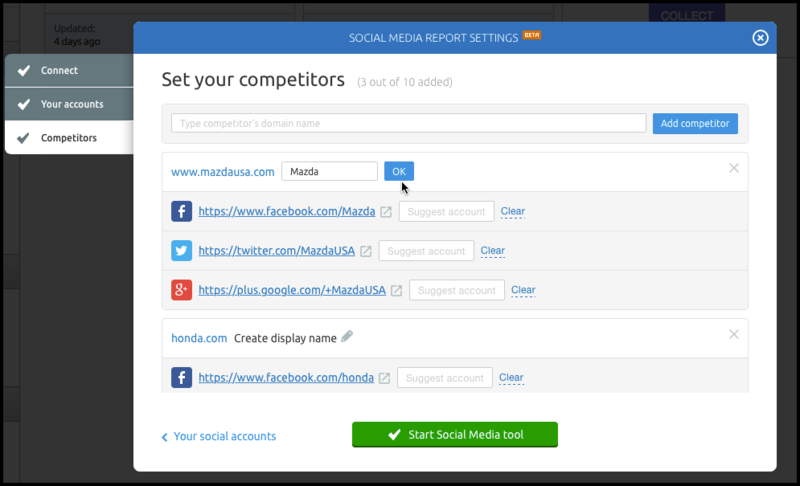 Use the dropdown menu to switch between data for your social media and the social media of your competitors. You can also specify the time period for which you want to display the data. Lower in the interface, there’s the Competitors Comparison section. 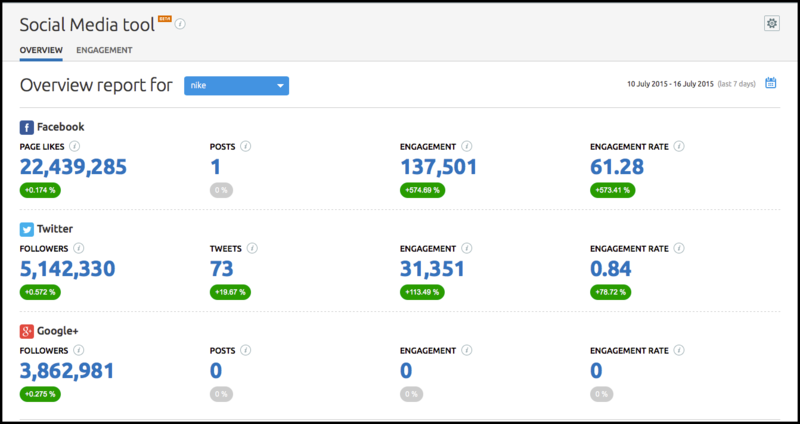 Here you can quickly compare your social media stats against your competitors. This section consists of two charts: the chart on the left displays your and your competitors' current data values, whereas the chart on the right shows how these values have changed during the specified period of time. You can choose to sort data either by 'value' or by 'change'. Please note that the right chart may be unavailable when you first start your new campaign, as SEMrush needs time to collect historical data. The second tab is ‘Engagement’. As the name suggests, it gives you a more detailed report on user engagement for a specified social media group, and is structured in a similar way as the Overview tab. You can also compare your social media activity with that of your competitors in the Trend section, which displays information in the form of a convenient graph. The ‘Comparison with competitors’ section works the same way as in the Overview tab. Starting your very first social media campaign with SEMrush is as simple as it gets.First, select a project and click on the ‘Set Up Social Media Tool’ button. 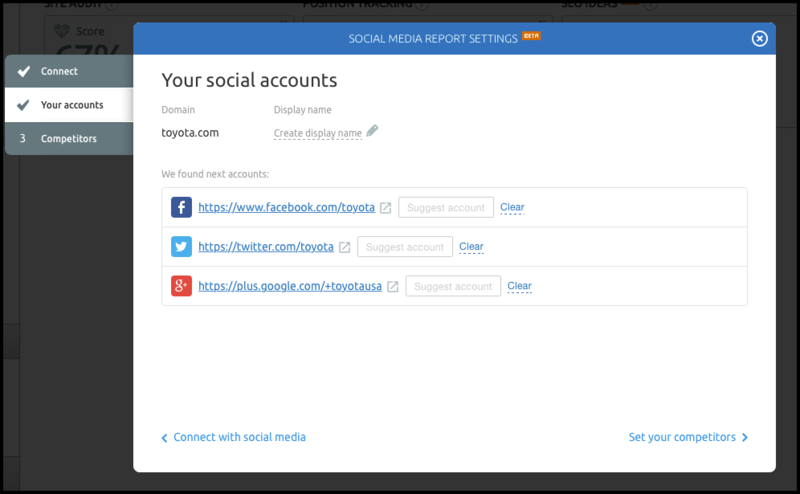 Next, connect your Facebook, Twitter and Google+ accounts in order to be able to view reports for the corresponding social media services and click on ‘Set your accounts’. Then, specify the social media accounts for which you want SEMrush to track data. By default, the tool will automatically suggest social media accounts relevant to your project, but you can also suggest an account manually. When you’re done, click on the ‘Set your competitors’ button. For your final step, you need to choose your competitors. The maximum amount of competitors you can add is one for free users and ten for paid users. Type in the domain names of your competitors and specify their social media accounts. When you’re done, click on the ‘Start Social Media tool’ button and start your very first SEMrush Social Media campaign! We would greatly appreciate your feedback on how the new tool works. Every opinion matters, so please don’t hesitate to share yours with us by dropping us a line at [email protected]! Introducing the New 'Pages' Report!